It's a basic fact of all boats. 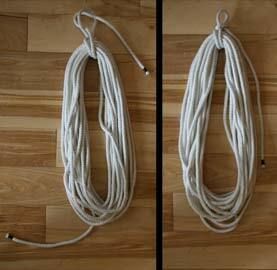 Any length of rope longer than 3 feet will magically knot and tangle itself. To avoid this there are a number of coiling knots that have been devised. This one is called the Fireman's Coil. I don't know if it's the best but it's the one I can remember so I use it. It's usually the first one you learn when you start sailing. I use this in particular when I coil up the end of my halyards and just hook it on the cleat that lives on the mast after I've raised the main sail and the jib. When I plan to put the rope in a locker I usually do a second loop through the first and tighten extra well. If the rope is going into a locker and not being hung up I tie the bottom too. I have small bits of rope and just make a quick reef knot at the bottom of the coil. I don't complete the reef knot but rather leave a loop so I can just pull one end and it unties. It's not a critical knot so the reef knot is ok there. Don't use it where your safety is at stake, it's not reliable. When I tidy up the boat after I've come in from a sail, I put a fireman's coil with a double loop in my main sheet and hang it up from the end of th boom. It keep it out of trouble and untangled. Chain Splice is a way of attaching a chain to a line so that it can easily pass through a windlass or a narrow opening without binding. The Young Sea Officer's Sheet Anchor is a fabulous reproduction of a sea related information necessary for training of officers. Knots of course but tons of info on sailing, rigging and other good stuff. Truckers hitch is useful when tying a boat on a car because it can be tightened.